Kelsey Miller has written the quintessential fan book for those obsessed with the hit TV sitcom "Friends." 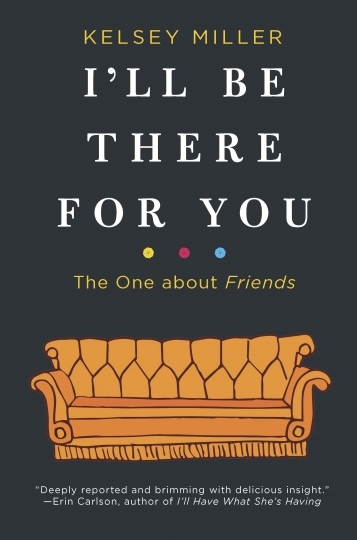 ''I'll Be There For You" gives readers an insider's look at what it takes to launch a show that not only had an impact on a decade of broadcast television, but also remains a pop culture icon. Miller leads readers through interesting insider scoop and includes various behind-the-scenes interviews spanning the length of "Friends." She highlights trends such as "the Rachel" haircut and high-profile celebrity guest appearances, but doesn't ignore the bad. One theme that weaves through the book is the camaraderie among the leading actors. Spearheaded by Lisa Kudrow and David Schwimmer, they were among the first to insist on equal pay for cast members. And Courtney Cox implemented the unofficial "all for one" agreement with the group. If one left, the other five would follow. Miller points out that "Friends," which debuted in 1994 and ran for 10 seasons, has withstood the test of time. Once Netflix offered the show to subscribers, a new generation began binge-watching six friends trying to make it in New York City. Finally, Miller compares "Friends" to comfort food. No matter what your mood, Ross, Joey, Chandler, Monica, Phoebe and Rachel will always be there for you.